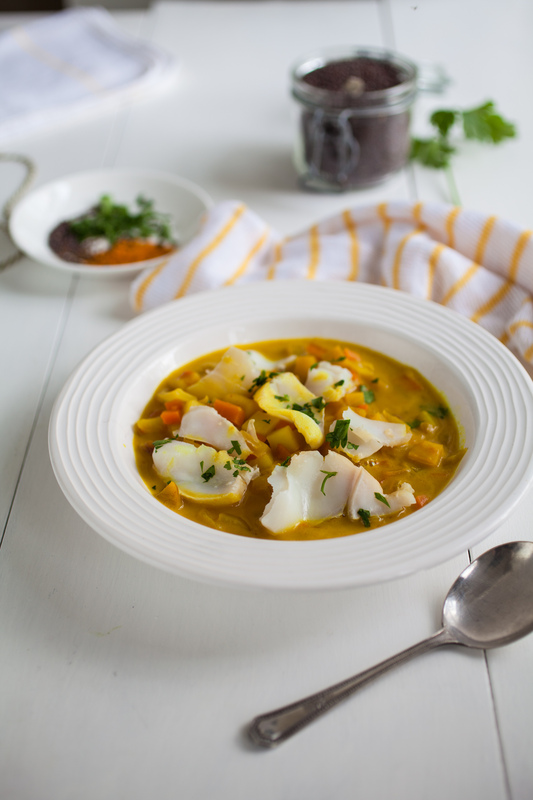 Chowder is a traditional fish stew cooked in milk and thickened with potatoes. It is a quick, flavoursome dish made from humble ingredients which taste spectacular. The key is to cook each stage carefully. I used almond milk instead of cows milk but any lactose free milk is fine to use. The vegetables used i.e. carrot, potato and swede are low in fermentable carbohydrates and inexpensive to buy. 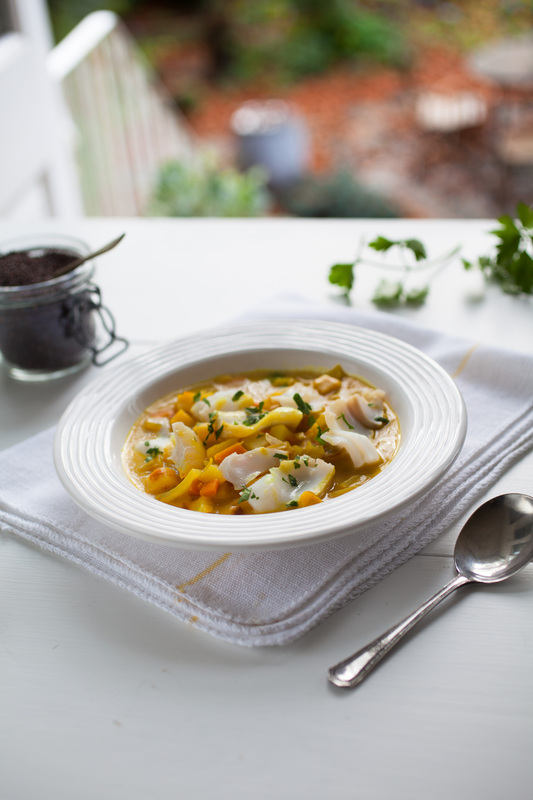 Smoked haddock freezes well and is a great standby for all sorts of meals. It is one of my favourite fish. 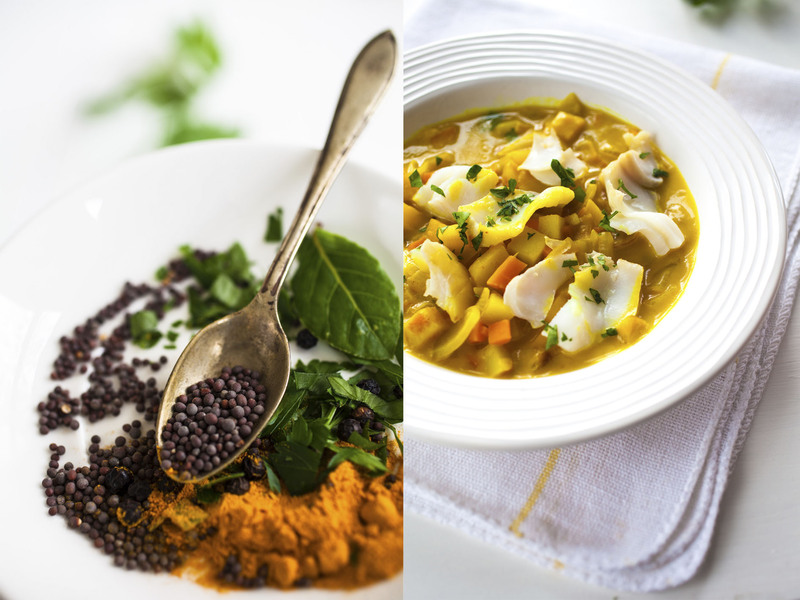 I also love using mustard seeds and turmeric which add colour and flavour to this dish. If you are passing an Asian grocery store pop in and buy some the prices are usually very competitive. *you can use garlic infused oil or a small amount of onion if you can tolerate it. 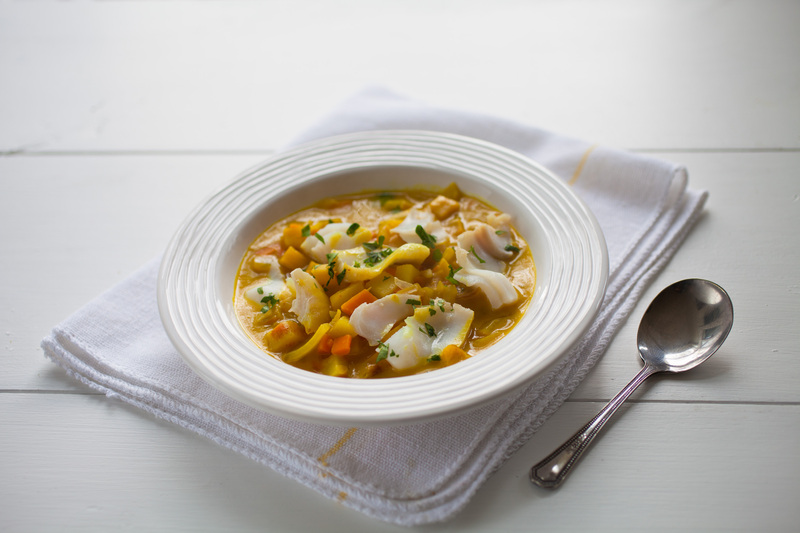 Cut each fillet of haddock in half and place in a large saucepan with the lactose free milk, bay leaf and peppercorns. Bring the milk to the boil, turn off heat, place a lid on the saucepan and leave the fish and herbs to infuse. Sweat the onion in the oil or butter until soft. Add the swede, carrot and potato to the onion and continue to cook for about ten minutes or until the vegetables are lightly browned. Add the mustard seeds and turmeric and stir well. Strain the haddock and reserve the milk taking care to remove the peppercorns and bay leaf. Sprinkle the flour over the vegetables, stir well and cook for a couple of minutes. Gradually add the infused milk to the vegetables and cook gently over a low heat until the sauce thickens. Place the haddock on top of the vegetables and warm through for a couple of minutes. Add the parsley, or coriander, season with salt and pepper and serve with a wedge of lemon. 02 Nov	This entry was written by Joan Ransley and published on November 2, 2014 at 4:14 pm. It’s filed under Dinner and tagged almond milk, cooking, dietetics, FODMAPS, Irritable bowel syndrome, lactose free, low FODMAP, low lactose, sensitive gut, Smoked haddock. Bookmark the permalink. Follow any comments here with the RSS feed for this post.